First there was the Red Amulet, its ruddy light staining their faces as if with blood. This was Hawkmoon's strength, giving its owner more than natural energy. Then there were the crystal rings of Mygan which could transport those who wore them through the dimensions. These were their passports back to their own space and time. Beside the rings was the scabbarded Sword of the Dawn. In this lay Hawkmoon's army [Legion of the Dawn]. And finally, wrapped in a length of cloth, there was the Runestaff, Hawkmoon's standard and his hope. Count Brass cleared his throat. “Even with all these powerful objects can we defeat an empire as great as Granbretan?” (p. 591). 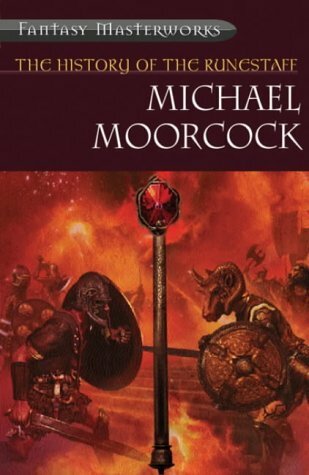 Published in 2003, the 36th entry in the Fantasy Masterworks series reprints the 1992 edition of the third volume in the Tale of the Eternal Champion series, a '14 volume set of omnibuses that present a considerable number of Michael Moorcock's Eternal Champion novels and stories in a 'recommended reading order'. The Mutiverse.org summary linked to above tells only part of the story, as each of the four volumes in the Hawkmoon tetralogy ('The Jewel in the Skull', 'The Mad God's Amulet', 'The Sword of the Dawn', and 'The Runestaff') originally written in the late 1960s had already undergone revisions in 1977: '[The Tale of the Eternal Champion] was originally published by Millennium/Orion in hardcover and trade paperback editions between 1992 and 1993, and then in mass-market paperback editions between 1995 and 1998. The series was jointly edited by Moorcock and John Davey, and presented Moorcock with an opportunity to make a number of revisions to the texts to give a more uniform feel to the Tale. Each omnibus also contained a new Introduction by Moorcock', which is included in this Fantasy Masterworks edition. 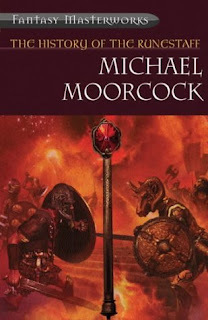 A further trilogy featuring Hawkmoon entitled 'Count Brass' (comprising 'Count Brass', 'The Champion of Garathorn' and 'The Quest for Tanelorn') was published as the fourteenth and final volume in the 1992-93 cycle. If the air of taint that hangs over the geography of the West in these novels can be seen to reflect in some way the author's own jaundiced views of the continent, then his metaphorical description of the temperament of his own countrymen is no more sympathetic. From Normandia to Ukrania, the land mass is in thrall to the decadent and cruel Granbretanians: 'their cruelty is without precedent. They are insane. Their souls are sick with a love for all that is evil, and a hatred for all that is noble'. (p. 21). Subsequent to his being taken prisoner in defence of his home city, the protagonist Dorian Hawkmoon von Köln is adapted by his captor, Baron Meliadus of Kroiden, Grand Constable of the Order of the Wolf, First Chieftain of the Amies under[...] great King-Emperor Huon' (p. 31): 'He lifted a hand to his forehead and felt with a shock something there that had not been there before. It was hard and smooth. It was part of him. He shuddered' (p. 67). The Black Jewel is capable of destroying the implantee's mind, and acts as surety to bind Hawkmoon to the desire of Meliadus to abduct Count Brass's daughter Yisselda from her ancestral home in the Kamarg, the last bastion of resistance against Granbretan. As with all of the Eternal Champion novels, there are forces at work outside the main narrative that are shaping its outcomes. This episode is merely one connection in a train of events that has already been set in motion by the mysterious artefact that gives the final work in the tetralogy its title. Many destinies are woven together 'to do the Runestaff's work which was begun when Meliadus swore upon the Runestaff his great oath of vengeance against the inhabitants of Castle Brass and thus set the pattern of events' (p. 423). The Runestaff is a implacable totem of chaos as well as peace, signifying balance, binding all who swear upon it: 'Again [Meliadus] had sworn by the Runestaff, as on that fateful morn two years before. And his action had set in motion a new pattern of history. His second oath had strengthened that pattern, whether it favoured Meliadus or Hawkmoon, and hardened all their destinies a little more strongly' (p. 331). Whilst the four novels ostensibly chronicle the struggle of the Kamarg alliance to repel and ultimately overthrow the might of Granbretan, in truth the 'justice' which the Runestaff metes out favours the maintenance of universal balance over an exceptionally long period of time rather than the advancing of the aims and aspirations of those who call upon it in the short term. This is difficult for the protagonists to discern as the devastating manifestation of the Runestaff's power sees the appearance of the latter mask the facticity of the former:'"By the Runestaff, we need aid!" [cried Hawkmoon]. Suddenly a strange electric sensation ran through his body and he gasped, recognizing what was happening to him, realizing that he had unconsciously invoked the Runestaff. The Red Amulet, [an aspect of the Runestaff] which now glowed at his neck, spreading red light on the armour of his enemies, was now transmitting power into his body[...] Then Hawkmoon was everywhere, a whirling bringer of death' (p. 321). Hawkmoon may come to 'resent the feeling of being the puppet of some supernatural agency', but there is little he can do about it (p. 529).